June 12, 2017, 12:15 p.m. Most people in the U.S. — 85 percent of U.S. adults — have used a mobile device to access news at some point, up from around just 50 percent in 2013. But put aside any assumptions about which groups of people are responsible for the big increases. More than two thirds (67 percent) of Americans aged 65 and older get news on a mobile device (in 2016, that number was 43 percent; in 2013, it was 22 percent). Mobile news consumption among 50- to 64-year-olds also increased sharply over the past four years. These numbers are all according to a Pew Research study. Pew surveyed people in March of this year. Monday’s findings are part of a larger report published last month about the partisan divide in media consumption and perception of the role of media, which found that Democrats were driving an increase in use of mobile devices to access news. Lower-income households are also increasingly getting their news via mobile: 79 percent of adults in households making less than $30,000 annually have accessed news on a mobile device (in 2013, it was 37 percent). 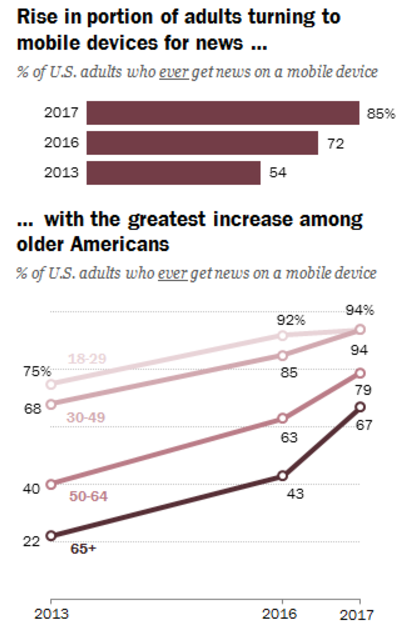 Mobile news use, like internet use and mobile ownership in general, was already very high among younger adults, leaving little room for growth compared with older adults. For example, 94 percent of both those ages 18 to 29 and 30 to 49 get news on mobile — unchanged since 2016 for 18- to 29-year-olds and only a 9-point rise for the 30-49 group. 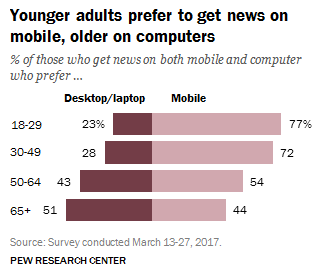 By contrast, among those ages 50 to 64 and those 65 and older, increases of 16 and 24 points respectively in the past year have resulted in majorities in every age group now getting news on mobile. A recent Pew Research Center report similarly found a sharp rise in overall technology adoption among older Americans. Wang, Shan. "85 percent of Americans use mobile devices to access news — and seniors are driving that number up." Nieman Journalism Lab. Nieman Foundation for Journalism at Harvard, 12 Jun. 2017. Web. 18 Apr. 2019. Wang, Shan. "85 percent of Americans use mobile devices to access news — and seniors are driving that number up." Nieman Journalism Lab. Last modified June 12, 2017. Accessed April 18, 2019. https://www.niemanlab.org/2017/06/85-percent-of-americans-use-mobile-devices-to-access-news-and-seniors-are-driving-that-number-up/.